If you are looking for a used Mercedes Benz CL500 in Vancouver, North Vancouver and surrounding area, the Goldline Motors sales team will be able to satisfy your needs. Goldline Motors always has a great selection of pre-owned Mercedes Benz CL500 in stock and add to the vehicle inventory daily. At Goldline Motors we proudly sell used Mercedes Benz CL500 to customers from Vancouver, North Vancouver, Richmond, Burnaby, Surrey, New Westminster, Coquitlam, Delta, Abbotsford and Victoria. The Mercedes-Benz CLA takes the successful four-door coupe styling cues from it's big brother, the CLS, and applies them to a smaller, less expensive platform, that more buyers will be able to appreciate. The CLA is a four-door sedan, but it's sweeping roof gives it a coupe-like profile. Two versions are available; CLA250 and CLA45 AMG. A 2.0-liter turbocharged engine sends 208-hp to a front- or all-wheel drive system on the CLA250, while the CLA45 AMG puts 355-hp to all four wheels, both through a dual-clutch seven-speed automatic transmission with steering wheel-mounted paddle shifters. The CLA250 features ARTICO seat trim, 17-inch alloy wheels, driver's memory seat, seven airbags, folding rear seat, Bluetooth and rain-sensing wipers. The CLA45 AMG ups the ante by adding 18-inch wheels with performance tires, ARTICO & DINAMICA seat trim, Bi-Xenon headlights and aluminum trim. Available features include dual-zone automatic climate control, panorama sunroof, navigation system, rearview camera, blind spot assist, lane keeping assist, Distronic and more. The CLA-class is entirely new to the Mercedes-Benz line-up for 2014. Source: Chrome Data. 2014 Mercedes Benz CL500 Review: The CLA45 AMG is fun to drive and sounds great, though there are plenty of worthy competitors at the near-$50k mark. Laura Burstein filed this report after her test drives of the CLA250 and CLA45 AMG around Washington. 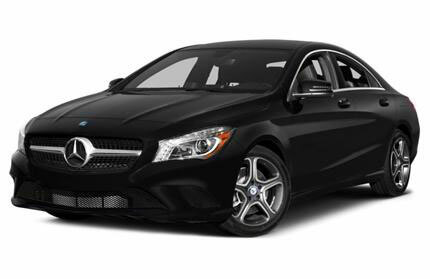 The 2014 Mercedes-Benz CLA-Class is a fine daily driver with a comfortable cabin for those looking to take the leap into luxury car territory, but it lacks the athletic handling of rear-wheel-drive vehicles around the same price. Source: Chrome Data.